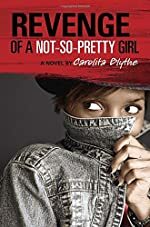 Revenge of a Not-So-Pretty Girl by Carolita Blythe. Review: Did you ever do something horrible that you still regret to this day? You probably think that what you did was just an accident and it wasn't really your fault, or was it? Is the guilt still right behind you blowing it's icy-cold breathe that's chilling your neck, making your hair stand on edge? If you had that experience, then you have something related to Faye, the main character of Revenge of a Not-So-Pretty-Girl, by Carolita Blythe. It is a great read that would keep you reading for hours and hours. Faye and her friends, Caroline and Gillian are bad girls. They feel justified to attack the rich because they feel like the rich takes advantage of money and also, they have a condescending attitude towards the poor. They are bad enough to rob and almost kill a poor old woman who lives in apartment 1H. Faye and her friends heard that a famous "movie star" (the old lady) lived in the apartment building. They needed some extra cash and they were bored, so there they were in the apartment building, patiently waiting for the lady to come home. When the lady finally walked in, she walked into the lobby with handfuls of groceries, Gillian and Faye rushed up to "help" the innocent lady. Caroline offers to bring the groceries inside her cozy little apartment. The lady accepts the offer, but what she doesn't know is that that was a big mistake. The next thing she knew, she was being pushed by one of the girls and being asked where all her money is hidden. Soon after, Faye fights with the old woman and sends her flying to the floor. The old woman laid there lifeless. Did Faye kill the old woman? Can Faye make it right or will she have to live with the dreadful wrong? Will Faye ever want to get revenge on anyone ever again? Revenge of a Not-So-Pretty-Girl is suspenseful, riveting, and compelling. In the book, the characters have interesting personalities. Like, "both of you, shut up," Caroline responds. "And why'd you have to punch me, Faye? Next time you do that, I'm punching you back harder." This statement also exemplifies that repeated exposure desensitizes a person's moral compass. In some situations within the story the setting can be confusing and unclear. There are also many moral messages. Like, desensitization, revenge, prejudice, karma, and guilt, power/control. Over all, I thought Revenge of a Not-So-Pretty Girl was a great book. I would recommend the book to people that like crime/drama stories. The age range for the book should be around 12-14 because the book has some adult language and has some complicated story lines. I hope other young readers will read and enjoy Revenge of a Not-So-Pretty Girl and you find out what really happens to Faye and the old lady. You will not be able to put the book down until you finish it! We would like to thank Random House for providing a copy of Revenge of a Not-So-Pretty Girl for this review. Have you read Revenge of a Not-So-Pretty Girl? How would you rate it?